A 9.86 acre site, comprising part former nurseries, part former market garden and part arable farmland. 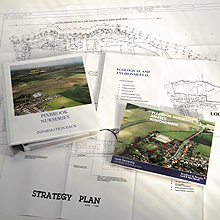 Originally featuring as an allocation in the Consultation Draft Mid-Bedfordshire Local Plan. However, against Planning Officer's recommendations Members decided against confirming the site's allocation in the Deposit Version owing to concerns, by members and residents, over perceived flooding problems. We submitted a Planning Application following negotiations with the Inland Drainage Board together with the Bedfordshire Wildlife Trust and the Local Conservation Group, ACORN. The Planning Application proposed residential development on nearly 6 acres of the site with the balance to be dedicated as a Flood Attenuation Area designed as a Nature Reserve. Following a planning refusal, an Appeal was mounted. The site was sold to Connolly Homes Ltd, after a two-stage Limited Invitation Tender, by the landowner's joint Agents, Bradford & Bingley Land & New Homes and The Levitt Partnership. A fully comprehensive Information Pack was provided and eighteen tender bids were received.